Floodlights: None although light from adjacent buildings should be just about adequate for track use. 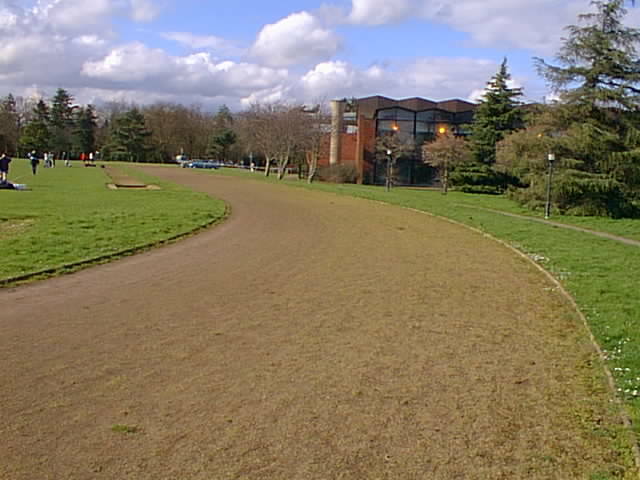 In the early 1960s, the whole estate on which the track now lies was sold by Sir David Yule to a US religious organisation. They built a university here for American kids and also built the track, swimming pool & Sports Centre which are next to the track. The university closed in the late 1970s and was bought in 1980 by CEGB to be used as their staff training college. The track & Sports Centre were then leased to the local council. National Power, the successor of CEGB, sold the training college in around 1993 but not sure if the land including the track was sold to the council or leased. The training college is now used by HSBC. The track is in fair condition but there are some weeds and it is obviously not used much. The infield is a football pitch.